Francisco de Zurbarán was born in Fuente de Cantos, in Western Spain, but spent most of his working life in Seville. Like Ribera, Zurbarán is also considered a Caravaggista (a follower of the Italian painter Michelangelo Merisi da Caravaggio, active 1571-1610) particularly for his exceptional use of chiaroscuro. These 13 paintings (12 by Zurbarán and one a direct copy of the work by Zurbarán) are a visual narrative of Jacob’s deathbed act of bestowing a blessing on each son, foretelling their destinies and those of their tribes. Although each painting holds its own as an exceptional portrait, seeing the works together provides a unique experience for viewers, transporting them across history to make them a witness to that moment. At the Meadows, the paintings will be displayed together in one gallery. It is not known who originally commissioned the series, but they were auctioned from the collection of a Jewish merchant named Benjamin Mendez in 1756. Richard Trevor, Bishop of Durham, acquired the paintings for Auckland Castle, seeing in the public presentation of these works an opportunity to make a statement about the need for social, political and religious understanding and tolerance between Christians and Jews in Great Britain. While in the USA, the paintings will also undergo in-depth technical study for the first time at the Kimbell Art Museum. This will include the use of infrared reflectography, ultra-violet light, x-radiography and pigment analysis. The goals of this work are twofold: first, to gain a better understanding of Zurbarán’s artistic process by exploring this unique series of related works; and second, to identify any additional needs for their ongoing conservation and care after they return to the U.K. Accompanying the exhibition and conservation research will be an illustrated catalogue containing scholarly essays exploring the series from various historical, religious and artistic perspectives. Dr. Mark A. Roglán, Director, Meadows Museum, is the scientific director of the project and has helped to gather contributions by Claire Barry, Director of Conservation, Kimbell Art Museum; Professor John Barton, Oriel and Laing Professor of the Interpretation of Holy Scripture, Emeritus at Oxford University; Dr. Jonathan Brown, Carroll and Milton Petrie Professor of Fine Arts at New York University; Dr. Christopher Ferguson, Curatorial, Conservation and Exhibitions Director, Auckland Castle; Dr. Susan Grace Galassi, Senior Curator, The Frick Collection; Akemi Herráez Vossbrink, PhD Candidate at the University of Cambridge; Alexandra Letvin, PhD Candidate at Johns Hopkins University; and Dr. Edward Payne, Senior Curator, Spanish Art, Auckland Castle. This exhibition and study have been co- organized by the Meadows Museum, SMU; The Frick Collection; and Auckland Castle; in association with the Kimbell Art Museum. A generous gift from The Meadows Foundation has made this exhibition and study possible, with additional support from the Centro de Estudios Europa Hispánica and the Center for Spain in America. This entry was posted in Exhibition, Uncategorized and tagged 18th century, akemi herraez vossbrink, Alexandra Letvin, Auckland Castle, benjamin mendez, Bishop Auckland, bishop of durham, Caravaggio, Center for Spain in America, Centro de Estudios Europa Hispánica, chiaroscuro, Christopher Ferguson, Claire Barry, Conservation, Dallas, Edward Payne, exhibition catalogue, Frick Collection, fuente de cantos, great britain, jacob and his twelve sons, John Barton, Jonathan Brown, Kimball art museum, Mark A. Roglán, meadows foundation, Meadows Museum, Painting, richard trevor, Seville, SMU, Spain, Spanish Art, Susan Grace Galassi, technical exhamination, tribes of Israel, UK, Zurbarán on September 15, 2017 by costanzabeltrami. 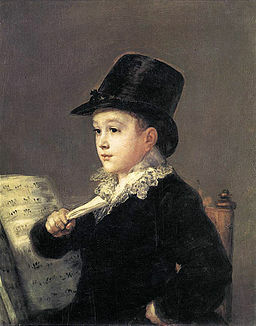 Goya’s portrait of his grandson Marianito has gone on exhibition at Ibercaja’s Museo Goya in Zaragoza. This entry was posted in Jesusa Vega, Meadows Museum, Nigel Glendinning, Spanish Art and tagged 2016, Jesusa Vega, Jonathan Brown, Meadows Museum, Nigel Glendinning, Spanish, Spanish Art on January 24, 2016 by M. Ellis.